In my last column, I wrote about green paint strippers based primarily on the solvent n-methyl pyrrolidone (NMP). The word “green” is used to indicate the solvent is less harmful to breathe and less harmful to the environment. Because of environmental laws in some parts of the country, finish manufacturers are supplying more products with less harmful solvents, even in areas not affected by the strict regulations. 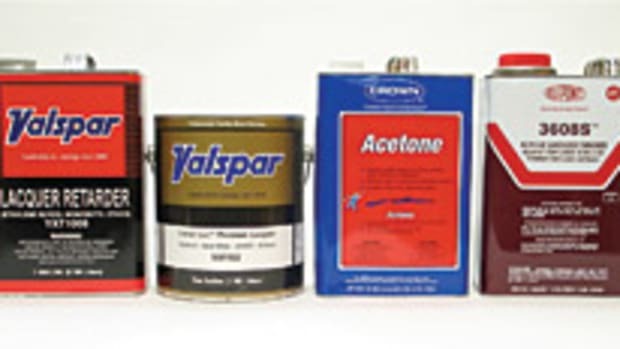 Included among these are the three solvents finishers use the most: lacquer thinner, alcohol and paint thinner. Here’s a description of each. 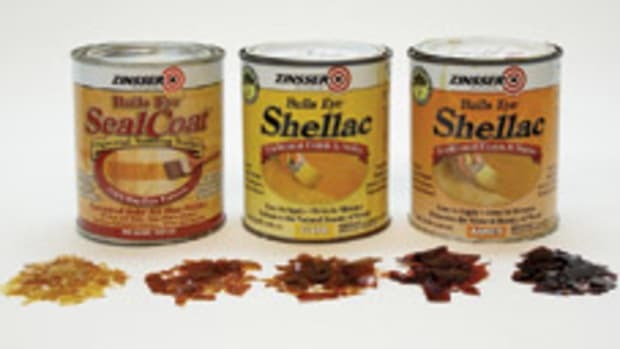 Traditional lacquer thinner contains half-a-dozen-or-so solvents that evaporate at different rates. There is enough solvent initially so the lacquer exits the spray gun easily, but the quick flashing off of one solvent after the other causes the lacquer to seize up quickly on vertical surfaces so it doesn’t run, while still retaining enough of the slower-evaporating solvents to level out well. It’s an ingenious system, actually, and it’s the principal reason lacquer is more forgiving than other finishes to spray. The problem is that most of the solvents used are classified as volatile organic compounds (VOCs) and hazardous air pollutants (HAPs), which means that they are bad for the environment and bad for your health if you breathe in excessive amounts. There are a few exceptions called “exempt” solvents, so manufacturers turn to these to comply with regulations where they exist. The two exempt solvents most used are acetone and parachlorobenzotrifluoride (PCBTF). The common brand name for this second solvent is Oxsol 100. You might see this listed on the can or on the MSDS. Both have problems. Acetone evaporates extremely quickly, more quickly than any other solvent for which we have access. Thinning lacquer with just acetone causes the finish to dry so fast that you can’t avoid dry spray at the edges of the sprayed patterns and you can’t avoid blushing (turning milky white) on humid days. So manufacturers have to add a slower-evaporating solvent to keep these problems from occurring and to allow time for the finish to level out. The exempt solvent most used is PCBTF. It’s relatively expensive and has a strong odor. It’s also not as slow-evaporating as non-exempt glycol ethers commonly used in traditional lacquer thinner, so glycol ethers are sometimes added if regulations permit this. Another problem is that there are usually only two or three solvents total instead of five or six, so the full benefit of successive flashing off is lost. The first time you use one of the green lacquer thinners, it might take you a few trials to get used to it so you avoid orange peel. You’ll want to go back to traditional lacquer thinner. Cleanup with green lacquer thinner is just as effective as with regular lacquer thinner, of course, because of the acetone. The two primary alcohols used to dissolve and thin shellac are methanol and ethanol. Methanol is poisonous and therefore a HAP. Ethanol is the alcohol in beer and wine; it is taxed like liquor. Traditional denatured alcohols are a mixture of the two. Methanol is more aggressive at dissolving shellac flakes and ethanol is safer to breathe. To make a HAPs-free denatured alcohol, manufacturers use only ethanol with a little of something else (maybe methanol) to make the product poisonous so it isn’t taxed. Therefore, green denatured alcohols vary little from traditional denatured alcohols. They might take a little longer to dissolve shellac flakes, but they are no different for thinning already-dissolved shellac. You can speed the dissolving by grinding the flakes into a powder or by heating the flakes and alcohol in a double boiler. The green paint thinners I first came across are the most unique of the three solvents. They are emulsions, which means the oily petroleum distillate is combined with water so that only about 30- to 40 percent of the product is actually petroleum distillate. As with other emulsions (for example, milk- and water-based finish), green paint thinners are white in liquid form, but the whiteness disappears from the thinner as it dries. Unlike many other emulsions, however, green paint thinners separate if left standing, so you have to shake or stir them before each use. You also have to shake or stir any varnishes or oils you might have thinned because these will also separate. This is a critical difference from traditional paint thinner, which doesn’t separate. Another critical difference is that these emulsified paint thinners don’t have the same solvent strength as traditional paint thinner. They might not be as effective at thinning some alkyd and polyurethane varnishes. They also might not last as long on the shelf. At least one brand I’ve seen tends to coagulate after a couple of years. Traditional paint thinners last forever for all practical purposes. The water content of these thinners is also something of which to be aware. It will cause the first coat of any product you thin to raise the grain of the wood. It’s a lot like using a water-based stain or finish. You have to sand off the raised grain and this risks sanding through to the wood and maybe removing some color. The obvious one is to use traditional paint thinner (if you have access to it) instead of green paint thinner to thin the first coat. You can then use green paint thinner thereafter and for cleaning. The other is to “bury” the raised grain just as you might do with water-based finishes. Don’t sand the raised grain until you have applied a full coat or two of finish so you don’t sand through. On the positive side, cleaning brushes is actually easier with green paint thinners because of the emulsion. Normally, I rinse my brushes in lacquer thinner or acetone after a couple of rinses in paint thinner to remove the oiliness of the thinner. This reduces the number of soap-and-water washings needed. But green paint thinners are not as oily so there’s no need for the rinse and only one or two soap-and-water washings are needed. It could be due to the problems with emulsified paint thinners that manufacturers came up with another solution for complying with regulations. But this solution also has problems. Manufacturers substituted a lot of acetone for mineral spirits, then labeled these paint thinners as “extra strength” or “fast” without explaining what could happen if you used the thinner to remove grease or wax, a common use. 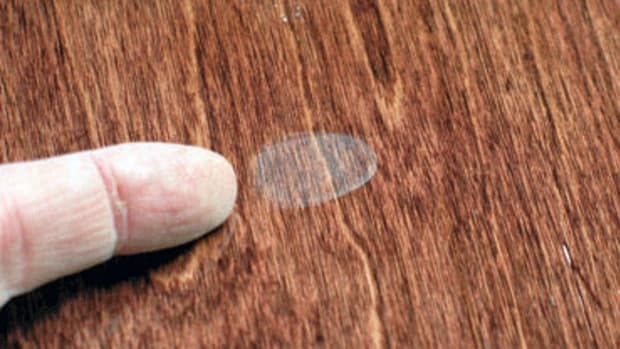 Acetone will damage and even remove many paints and finishes. If you live in a part of the country with strict air-quality laws, you need to be aware of the downside of this type of compliant paint thinner. Professionals and amateurs in the more restricted areas of the country (for example, California) are struggling with compliant solvents. Solvents make finishes work. If you still have access to traditional solvents, be thankful.